There are many interactions that the cucumber faces ever day. While most of them are not harmful, like human hands tending to their garden or the bee pollinating the flowers, there are some bacteria, and insects that cause this plant harm. One disease caused by bacteria is bacterial wilt of Ercinia tracheiphila. The plants that encounter this bacterial will quickly wilt and dry up. Bacterial wilt is carried from plant to plant by two types of beetles that like to feed on this plant. The stripped and spotted cucumber beetles. 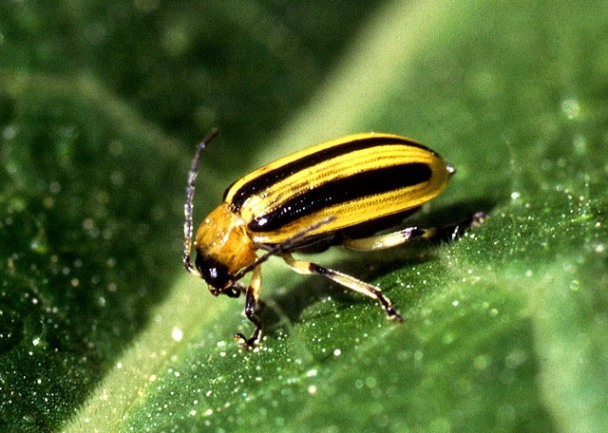 So to stop the spread of this bacteria, the cucumber beetles must be controlled. Gardeners can either use a resistant form of cucumber or other methods include covering the plants with polyester covers or just planting enough crop so that when one becomes infected, it may be remov ed. Other problems encountered are insect problems. These include aphids, worms, and the two beetles just discussed. The melon aphid or Aphis gossypii can infest many different plants within a greenhouse or in the open but extremely effected are the cucumber family. Aphids cause the fruit to be sticky and can transmit viral pathogens. To tell if a plant has been infected, look at the leaves. If the leaves are twisting or cupping then they have been affected. To check your plant for aphids, usually check the underside of the leaves. Another pest is the melon worm and pickleworm. The melonworm, Diaphania hyalinata, has the appearance similar to that of a caterpillars and have two narrow white stripes running the full length of its body, and they feed mostly on the foliage of the plant but like the pickleworm they may burrow into the fruit. The pickleworm, Diaphania nitadlis, ranges in color anywhere from white to green, but the larva have brown heads. These insects are burrowers, into fruit, the buds, blossoms and vines. Lastly the spotted cucumber beetle, Diabrotica undecimpunctata howardi, and the striped c ucumber beetle,Acalymma vittatum. 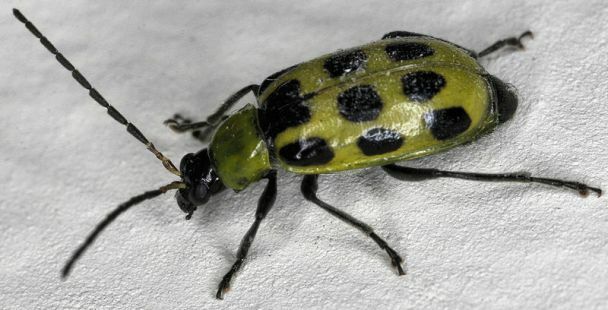 The spotted cucumber beetle is a minor pest, especially in comparison with the striped beetle. The spotted beetle can cause injury occasionally but not as devastating as the striped cucumber beetle. The striped beetles hibernate under trash or in the ground and when the seed begins to germinate, they are there. By attacking the young plant's leaves, they cause tremendous damage to the developing plant. Also the adult beetles are able to carry the bacterial wilt which will further damage the cucumber plant. This beetle lays its eggs in the end of June on the soil surface and when the eggs hatch a week latter the new larva work their way down along the stem burrowing into it causing irreversible damage. To learn more about how to pickle cucumbers click here.